The day this song is being released is the 20th anniversary of my first date (“date-iversary”) with Kit O’Connor, who became my best friend, partner, and spouse. I couldn’t do any of this without them, and I wouldn’t want to. 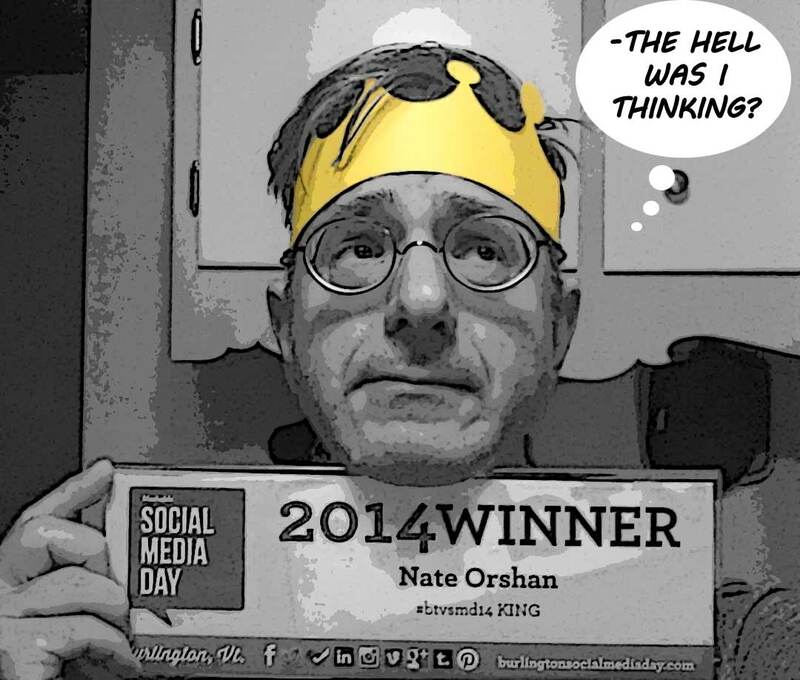 It’s taken me a couple of years to finish, but I’m back with the song I promised when I won the Burlington Social Media Day award, “2014 Social Media Royalty > King”. 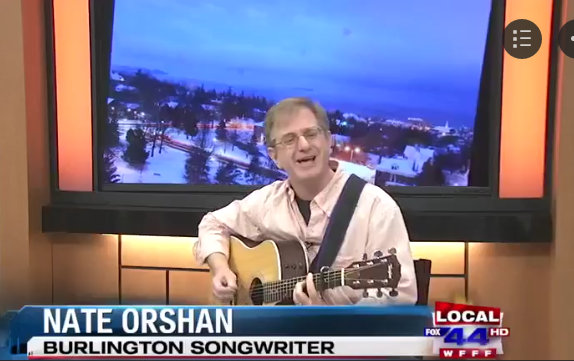 Here it is, my love song, the anthem I wrote for and about my beloved hometown, Burlington, Vermont. It’s called, “Sweet Little City (by the Cool Blue Lake)”. To rewind the story: as part of my shameless shilling for the 2014 Social Media Day votes, I promised people I’d write a song about whatever they wanted…which would be decided via an open form on this site as well as a round of voting on all the nominations. But…”A Day in the Life”? REALLY? That would (a) take some serious production chops, (b) seem like an act of superfluous redundancy (the world already has the real “Day in the Life” alongside the rest of the band’s multiple, quintessential singularities), and (c) oh, did I mention the production chops? And need for time? And…talent? However…what if I tried to cough up a genuine anthem for the Queen City? That’s a real challenge of its own, not the least of which is it means I’d have to set aside the obligatory Portlandia jokes and try to really be, y’know…sincere. And anthemic. So I took a page from Ludwig van Beethoven…almost literally. 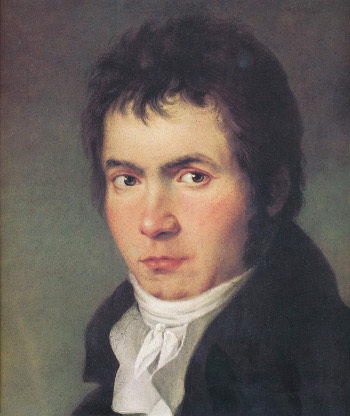 I basically stole many of my song’s melodies from the first movement of Beethoven’s Sixth Symphony, the “Pastoral”. Oh, you know…the one from Fantasia. Those melodies. Those MELODIES! They’re energetic. They’re inspiring. And above all, they’re free for the taking (“Famous Last Words”). Hey, why reinvent the wheel when Ludwig has a whole…van? Come to find out, trying to make Nineteenth Century classical music melodies work in a semi-modern context ain’t a walk in the Pastoral. Want to really rock out? Or go in a less harmonically predictable direction? Good luck with that, especially if you’re not trying to do a parody or otherwise attempting some kind of aesthetic sabotage to the tune. The melodies are confident and capable, but they work best with the kinds of chords and harmonic motion that Beethoven would understand. As far as I know (and I’ve worked Google pretty thoroughly), I haven’t found any evidence of anyone ever having attempted to adapt any part of the first movement of Beethoven’s 6th Symphony into a folk/pop song. So…a first? You tell me. The song tries to describe some of the things that make Burlington so special, starting with the fact that it occupies land dug out by a monster glacier tens-to-hundreds of thousands of years ago; that it has a chill vibe; that the University and other colleges influence almost every aspect of the city; that we take winter as a matter of course (and seemingly thrive); that artists play an influential role in the culture and, indeed, politics; that social justice is taken seriously; and, of course, that this place is endowed with just jaw-droppingly amazing natural beauty. Just the facts, van. The pictures in the video all came from the Burlington Hazecam, an amazing site that for over ten years has been providing fresh pics every 15 minutes of the way the western skyline over Burlington looks. I went through a period of my life where I had the site bookmarked, and I’d check it regularly, and if the pic looked good, I’d save it. The pics have been languishing for all these years, waiting for an opportunity to be put to good use. I hope I just did. The song is dedicated to the memory of Nelson Brice, Jr., a dear man and neighbor of 16 years who passed away this month. He was a true son of Burlington. Thank you for taking the time to listen to my love song for the city I call home. May she always get to stay by a crescent bay on the left coast of Vermont. Why my Twitter handle is misleadingly @Winooski. My song for then-candidate, now-Mayor Miro Weinberger. How the songs get to be so catchy. Thank you Lara Dickson for organizing Social Media Day in the first place. It was fun and inspiring. Thank you to all the people who chimed in with tunes I should write. I hope this one works for now. Thank you to the love of my life, Kit O’Connor, for always inspiring me and for putting up with me throughout a fairly arduous process. …And thanks to Ludwig van Beethoven for the killer tunes. Here’s a pic supposedly from around the time he was actually working on the Sixth Symphony…either that or, by the looks of him, playing with The Kinks. What Should I Write a Song About? – Final Round! OK, last week you collectively submitted forty-one song ideas for me for me to write a song about. I told you I was going to figure out the topmost titles or themes, and then have the run-off vote where you pick from the top three-to-five. Well…I just couldn’t do it. The figuring out thing. Part of it was just good, old-fashioned laziness, but most of it was being in sheer awe of how twisted some of you are. “Tell me the truth about lying”? “Burlington, Barcelona, Bahrain, Botswanna, Be My Baby #BTV”? “Mr Ding-a-ling’s ding dong singalong”? I mean…you guys do know I’m a serious songwriter, right? Ah well, a promise is a promise, so…here we go! Forty-one song titles or ideas are going into the ring, and only one is coming out. Make your choice. Hell, vote multiple times. I’ll leave the form open through the next weekend, and then, early next week…I move to Canada. Or reveal the next song you want me to write.